I am so excited to finally be sat here and writing this post for you guys. Anybody who knows me and who has followed my blog for some time already will know that I am an absolute foundation junkie and over the past couple of months I have been trying out the YSL All Hours Foundation. I wanted this foundation from the moment that it was released, but I wanted to wait for a while and see some reviews on it before I went ahead and bought it for myself. In the end, I saw Casey Holmes talk about like this over on her YouTube channel just the once and before I knew it I was checking out with this over on Boots. First up, I want to talk about the packaging of this foundation as normal because it is always the first thing that I talk about in my review posts. 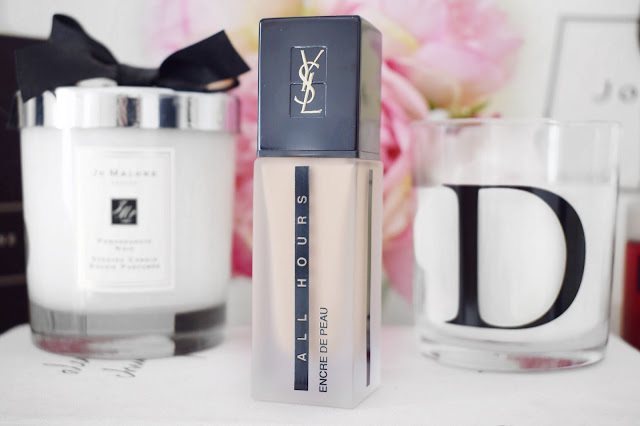 The packaging of this YSL All Hours Foundation is very lovely and sleek, and I would really expect anything less from a high-end brand such as YSL. I really love the square packaging because it looks like an expensive and luxurious product. I also really love that this comes with a pump because there is nothing worse than buying a high-end foundation and then having to spend more money on a pump. To me, I think that the packaging is right up there with the original YSL Touché Eclat Foundation which is simply stunning. When I came to buying this foundation, I will admit that I did struggle to find my exact shade. I tend to get foundations that are yellow tones because I have an olive/tanned complexion and it just works for me the best. After looking online at this for the longest time I finally settled on the shade B60, which seemed like it would be the closest match for me. I will say that the shade is good, and I can wear it and it wouldn’t look unnatural. For me though, I do find it a little more red-toned, which is something that I usually stay away with, but with concealer and powder it does tend to neutralise the red. Now, I want to talk about the consistency of this YSL All Hours Foundation. When I apply this to the face it glides on so nice and smoothly. To say that this is a matte foundation, I found that it glides onto the skin like a lovely and hydrating foundation. There is nothing too drying about this foundation and it allows you plenty of time to blend it into the skin before it dries down properly. I find it super smooth on my skin and it blends in like a dream. I have paired this with a damp Beauty Blender and a brush to blend it in with and with both of them it looks really stunning! The coverage of this foundation is just perfection. I would say that the consistency of this YSL All Hours Matte Foundation is very similar to the coverage of the Touché Eclat Foundation. To me, I would say that this foundation is a medium/full coverage foundation that definitely weighs down more on the fuller side of things. It doesn’t quite cover all of my pigmentation on my cheeks with the first layer, but with a light second layer, everything is completely covered. I just want to say that even with a second layer of product, it doesn’t feel in anyway heavy on my skin and it still blends in really lovely. 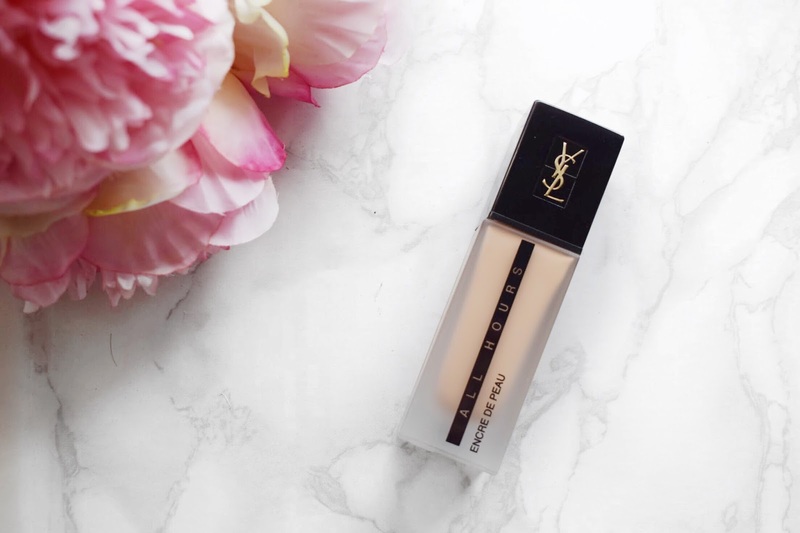 When I apply this foundation first thing in the morning and then I go in with all of my usual products and set the face, this YSL All Hours Foundation lasts me all day long. I do have to blot throughout the day around my nose where I get quite oily, but that isn’t anything very new for me. Personally, I would rather a foundation let me skin breathe and let my natural oils out throughout the day and not be overly matte and uncomfortable on my skin. I also find that no matter what I pair this foundation with it just looks beautiful and stays put all day long! This foundation set me back around £32, which for a high-end foundation is a pretty standard price. I think that that is a really great price for a foundation of this quality and I know that I am going to be continuing to use this in the future. If anybody wants to check this foundation out for yourselves, I will leave a link to it down below. Make sure to leave me a comment down below if you have tried this foundation and what you thought about it. Also, let me know if you want to try this foundation out for yourself and if you fancy trying it! It is such a lovely foundation, I really cannot stop using it at the moment. So amazing and matte for the warmer summer weather! Love the packaging on this, this seems so perfect and lightweight for summer! I am loving it at the moment, it is keeping me nice and matte in the heatwave! So far, all i've tried the YSL touche elcat blurring primer but I'm seriously curious about their foundations. This particular one sounds like it may be too drying on my dehydrated skin but I definitely need to try more of their base products. I really want to get my hands on the blurring primer, it looks so lovely! It really is lovely, I couldn't recommend it enough! I've been meaning to try this out! Thank for sharing your thoughts! I am obsessed with it at the moment! Sounds like such a brilliant foundation! Will put it on my list for sure. It really is amazing, especially for this bloody heatwave! I really cannot get enough of it at the moment! I am in love with it, such amazing quality! Aww thank you sweetie. Things can only get better I guess! I really wish there was a better way to find a foundation match, I'm also a bit of a foundation junkie and always struggle with finding the right match. This foundation sounds amazing, might give it a try! It can be hard, I just try to look at as many swatches on Google and Pinterest as I can! It can be very hard. If you can, go into store and get a colour match! I know, that really is the best thing about this foundation. So lightweight and lovely! Sounds really rather amazing! I love a good matte foundation, but that isn't drying at all and goes on super smooth. I still have loads of others to use up first though, but I'll definitely keep this one in mind for my next foundation purchase! Thanks for the lovely, in-depth review! It is a great foundation, I am completely in love with it!